As part of our IT Transformation practice, AP Benson works with clients to specify, procure and implement a range of Finance and Business Management Systems (FBMS), Enterprise Resource Planning (ERP) and Professional Services Automation (PSA) solutions. We have worked for over 10 years as independent consultants supporting organisations through the Needs Assessment, Statement of Requirements/Specification, Solution Identification, Procurement and Implementation processes needed when implementing Enterprise Resource Planning (“ERP”) or Professional Services Automation (“PSA”) solutions. Although we have worked with a wide variety of ERP and PSA package vendors and implementers we have no financial or other formal relationship with any vendor or implementer. We are therefore, able to provide fully independent advice on this populated market place on the detailed analysis of needs, statements of requirements and specifications, on potentially matching solutions, the procurement process and during implementation. We have advised over 20 organisations in the public and private sectors on ERP needs assessment and procurement including most recently leading an ERP specification, procurement and implementation project for Transport for the North (TfN) and undertaking an ERP requirements review for Transport for Wales (TfW). Human resources management and governance. Work to review, score and provide objective and independent assessments bids received, providing recommendations for review to the client’s ERP steering group to allow them to take a final decision on selection of an implementation partner. ERP specification, selection and implementation is an established process and there are established selection methods. Our scope of work will usually be tailored to meet a client’s needs in an initial meeting with the client but is typically based on our Needs Assessment Process. This is based on creating a clear understanding of needs and requirements and expressing these as a specification to which vendors can respond. Selection of solutions should be based on an objective scoring and decision-making process and should involve representatives from affected areas of the business. A similar process is followed where a broader roll out of existing ERP capabilities is planned or where a failed ERP implementation needs to be assessed and addressed. The process we follow is one of (i) Needs Assessment, documenting business processes and requirements and developing a specification that can be used in a procurement process; (ii) Solution Identification and Tender Preparation: translation of the specification into a form in which it can be used to seek bids from potential vendor/implementation partners identified as having suitable solutions (iii) Procurement: work with client procurement managers to manage a procurement and selection process, and (iv) Implementation Management: work with client and vendor/implementers to ensure a smooth implementation process and to assist clients in vendor management. Typical ERP solution needs assessment, procurement/selection and implementation is a 6-12-month process when undertaken alongside “Business as Usual” operations and involving operational staff also engaged in their usual roles. AP Benson works with clients to understand how an ERP system might support existing or newly designed business processes. It is usually intended that the ERP system will become the main business management IT system used to manage, control and report on the operation of an organisation. As such the ERP will be required to support all the key business functions in that organisation, and will have a role in the management of production processes, programmes and projects as well as in the control of support and back office functions. For a typical organisation these are summarised in the diagram below. 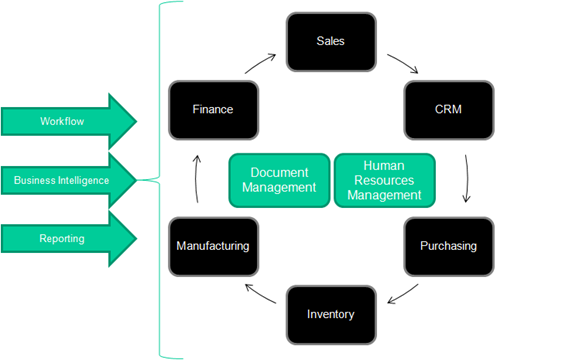 Manufacturing clients will focus on the supply chain management, inventory management and manufacturing management capabilities of an ERP system. Integration with factory floor systems may allow for greater control over manufacturing processes and scheduling and for reporting on throughput. Professional Services Clients' requirements may seek an ERP system in the Professional Services Automation category (“PSA”). Those familiar with ERP software may consider PSA as an ERP system for service organizations, the term Enterprise Programme/Project Portfolio Management [EPPM] may also be relevant. Programme management, procurement and document management and associated control of workflows are likely to be important to professional services organisations. All clients will favour solutions that allow them to maintain flexibility and the ability to adapt to changes in demand, categories of work managed, and in relationships with customers, partners and sponsors. AP Benson initially undertook a study of the ERP marketplace in 2007 for the Welsh Government and HCD Group in which we reviewed over 50 ERP/PSA solutions from a field of approx. 300 general and specialist solutions were identified. We have regularly updated our review since then, in 2010 for the Advantage West Midlands / Business Link Technology at Work programme and more recently as we undertake each of our ERP specification / procurement projects for individual clients. Although there has been some consolidation in the field since 2007, the market remains fragmented with a large number of ERP solutions, many with small but viable user bases. There are, however, some clear market leaders with solutions offered to suite a range of organisation scales and sectors. The ERP marketplace has, along with much of the software industry, evolved in recent years with most providers now able to provide Software as a Service (SaaS), hosted, or Cloud-based offerings. Traditional on-premis solutions remain available and are likely to be supported for some time by vendors, although many are being moved into hosted settings rather than being maintained on on-premis hardware. Learning from past generations of ERP implementation has guided organisations towards acceptance of ERP systems with little customised (“bespoke”) functionality and with minimum configuration. Customisation and unusual configuration adds to maintenance and upgrade burdens and, therefore, to running costs. ERP systems represent a substantial body of good practice and learning embedded in the products and adoption of “as is” functionality can represent an opportunity for user organisations to adopt streamlined and improved business processes. Recent implementations, for example our work with TfN, have followed this “as is” implementation path. Implementation based on a full understanding of likely organisational needs through a planned system lifespan of, say, 5 years, together with an “as is” approach and a phased and robust implementation plan is most likely to yield a modern, optimised and integrated ERP solution. Thorough identification of needs, clear statement of needs in a specification document and identifying the closest match of needs with solutions available in the marketplace, adopting the best match solution that does not need key functionality to be delivered by bolt-on software where interfaces need to be maintained will ensure that the system is optimised and integrated in a way that best supports those organisational needs. These represents a major change for system implementation and support partners who have traditionally generated income from lengthy implementations requiring substantial programmes of customisation and configuration and from subsequent maintenance of customisations through future upgrade processes. The cost of carrying forward customisations has often been a break on organisations’ willingness to continue to upgrade their ERP solution. An ERP that does not continue to develop tends to become less useful to an organisation over time as it develops away from its initial ERP implementation organisation structure. Adoption of a software as a service model, with upgrades delivered as part of the service and in which non-standard customisation is avoided unless absolutely necessary means that implementation/support partners must now focus on ensuring client organisations maximise benefit from the ERP system and support they receive. Recent ERP offerings include a range of business information tools that include roles-based and personalised dashboarding, workflow management that helps users to organise work and to fulfil their roles within workflows. Introduction of AI into business information tools can allow for ad-hoc reporting and analysis, in some cases providing tabulated and graphically presented data in response to natural language questions, for example the incorporation of Cortana functionality into the Microsoft Dynamics 365 offering. Cloud-based (public, private and hybrid cloud) offerings are available from many of the established ERP vendors and their implementation partners. This can simplify deployment and maintenance, shifting the burden onto the data centre and limiting on-site hardware investment required. It also means that the solution can easily scale with the needs of the organisation and that licensing and costs can mirror organisational needs. Cloud hosting also provides for greater flexibility and delivers inherent business continuity features. Cloud hosted systems (subject to appropriate security measures and access control) can support a flexible agile workforce, supporting home and mobile working. Many offerings support multiple platforms such as traditional laptops and “surface” style devices while also supporting tablet and mobile devices. Most support multiple operating systems and browsers, although it is important to understand which devices and browsers are supported by each solution OS may consider. Many support the deployment of mobile apps to support specific functions such as time and expenses recording. Consideration will need to be given as to how cloud-based systems can interface/integrate with other OS systems hosted by different data partners and with any legacy on-premis systems (if this is a requirement) and any limitations that cloud-hosting might bring to potential interoperability of systems. A proper understanding of the hosting model, physical location of data, backup and failover options is needed to understand the impact of cloud hosting on data security/protection, compliance (both now and in a future post-Brexit environment) and resiliency (business continuity). Consideration should also be given to, (i) available project budget, (ii) whether the client wishes to build on existing solutions and investment (including by partner or sponsor organisations) or is intending to procure a new solution, (iii) the scale of the organisation and complexity of operations, (iv) the category of business, (v) the capacity to undertake change (which can be addressed through different approaches to implementation, change and adoption plans), (vi) the match of solution(s) to business culture, and (vii) whether costs are warranted by returns or savings. Remote access, mobile working and access by partner, sponsor and advisory organisations may also need to be considered. AP Benson has been appointed to deliver the Welsh Government’s eBusiness programme and the Advantage West Midlands IT Advisory Service programme on which we have advised over 300 companies on implementation of suitable “right sized” business systems. We have experience of serving public sector and public sector sponsored delivery bodies as clients. AP Benson has worked on projects that have considered or used ERP and PSA products from Oracle Primavera, SAP, Sage (200, 500, 1000 and X3, Deltek, Union Square, Atlantic Global, Lawson, SAS, Microsoft Dynamics, Epicor, Netsuite and Syspro. We are aware of and have contact with over 50 solutions providers in this market place. Our role is to provide clients with independent advice and assistance in selecting solutions that bet match their needs. 2017 (Ongoing) Transport for the North: As ERP System Advisor, AP Benson led the process of needs definition, documentation of requirements, specification of the required ERP solution, development of procurement documentation, initial engagement and management of a tender process with potential suppliers of ERP services from within TfN’s set of partners, management of a second tender process using the Crown Commercial Services RM 1042 Lot 1 Corporate Software Solutions (ERP) framework and completion of a process of demonstrations and clarifications with shortlisted vendors. In Autumn 2017 the project selected an ERP provider, eBecs/DXC from a final field that included Microsoft Dynamics and SAP Hana solutions. The project completed release 1 of its implementation phase in time to support the launch of TfN as a statutory body on 1st April 2018 and recently reached release 2 to support HR and finance functions needed to support the transfer of employees into a 100-employee organisation. The system will be further enhanced with a release 3 deployment scheduled for autumn 2018 and subsequent development timetabled thereafter to support service delivery over the contract period. 2015-2016 Transport for Wales: the Welsh Government Transport Company AP Benson was engaged in September 2015 to advise on and assist in the development of its ICT infrastructure and in the development of its business processes and supporting ICT systems. AP Benson acted ICT advisor and worked to specify requirements and manage the procurement processes for nine “packages” of ICT infrastructure at TfW’s new central Cardiff offices. These have included elements of a secure and simple network infrastructure for a bring your own device (“BYOD”) user group and provision of high availability cloud hosted ICT systems supporting day to day needs and providing robust business continuity / disaster recovery. In the latter stages of the project we laid the groundwork for an ERP Needs Assessment process for TfW. The process to date has included initial process mapping and process design workshops with senior programme management staff, presentation of initial findings in a project kick-off meeting with the Senior Management Team, initial advice on the ERP market place, and possible product matches and likely budget levels given current understanding of needs. TfW intend launch a project to select and implement an ERP solution in 6-9 months. 2014-2016 Cambrian Pet Foods Limited: a £22.5m turnover manufacturer of pet foods. AP Benson undertook a full process analysis and needs assessment process with this company, developed procurement documentation and a managed a procurement process resulting in the selection and implementation of an updated ERP solution. Tenders received and scored from 16 combinations of solution and implementation partner, interviews with 4 shortlisted bidders and reference site visits with 2 bidders. We guided Cambrian’s final selection and chaired a final negotiating meeting with the preferred supplier. Implementation is planned for Autumn 2016. 2014-2015 Read Construction Limited: a £14.5m turnover specialist construction business. Work was undertaken to document needs and to identify and seek bids from specialist ERP/PSA providers able to provide an ERP system compliant with specialist construction industry requirements for project management and “BIM” (Building Information Modelling). 2012-2017 FSG Tool and Die Limited: a £6.4m manufacturer of tools and dies in the food and engineering sectors; We undertook a range of work for this company on improving ICT systems, including, latterly, the management of the needs assessment, specification and procurement of an ERP solution to replace existing poorly integrated finance and production management systems. 10 bids received from a variety of ERP publishers / implementers. Bids were scored and a shortlist of 5 bidders were interviewed. Recommendations were passed to the FSG board on the selection of an ERP system and implementation partner. Implementation is planned during 2018. 2011-2012 Invertek Drives Limited: a £23.3m turnover manufacturer or electric motor control systems. Process analysis, needs assessment, specification, solution identification and procurement management of an ERP solution. 22 bids received, 5 shortlisted and interviewed, recommendation provided to Invertek finance director and Board. 2008-2009 Pelican Healthcare Limited: a £25.8m turnover manufacturer of feminine hygiene and stoma care products; Process analysis, needs assessment, specification, solution identification and procurement management of an ERP solution. 2007-2008 Bon Bon Buddies Limited: a £39.1m turnover manufacturer of licensed character confectionary products; an implementation turnaround project for a Microsoft Dynamics ERP including process mapping and selection of a new implementation partner. 2007-2008 HCD Group: a £7.5m turnover building control/consultancy sector practice; Process analysis, needs assessment, specification, solution identification, procurement and implementation advice in relation to a PSA solution. 2007-2017 Texturing Technology Limited: a £4.6m turnover TATA group and Court Holdings company. Work as IT Advisors, including work to project manage the design, development and implementation of a bespoke ERP system based originally on Oracle and then redeveloped using Microsoft components. Work to develop ERP projects with other TATA steel rolling centres including the Ijmuiden steel site. Other ERP/PSA clients include: 2013-2016 House Name Plate Company; a manufacturer of homeware goods, related to the Timpson’s group and a supplier to B&Q and other homeware outlets; 2010-2011 SA Partners; a Lean consultancy practice; 2007-2008 Total Engine Solutions Aviation engineering and consultancy sector; 2007-2008 Williams Medical Group Healthcare consumables sector; Work undertaken by our SAS specialist: Mercedes Benz, Lloyds Banking Group, Cooperative Banking Group, Bank of America and Matalan.